The Lift Doctor's tips on how to recognize and stop carpal tunnel syndrome. by Victor R. Prisk, M.D. If you regularly work with your hands, especially performing repetitive work, it is highly likely that you have heard of carpal tunnel syndrome (CTS). CTS results from compression of the median nerve as it crosses your wrist through a tunnel created by your wrist bones and the ligaments that connect them together. Gym rats may be at increased risk for CTS from overtraining with pulling and pushing movements. Excessive wrist flexion in pulling movements or pushing too much from the base of the palm (closer to the wrist) can lead to nerve irritation. Use of extraordinarily tight wrist wraps or lifting straps can also lead to carpal tunnel compression and subsequent CTS. Forceful flexion of the wrists during lifting movements can cause shooting pains or “zings” from compression of the nerve, hinting toward improper form. Once the condition is diagnosed you must be vigilant to get the nerve damage under control. If not, CTS can require surgery. 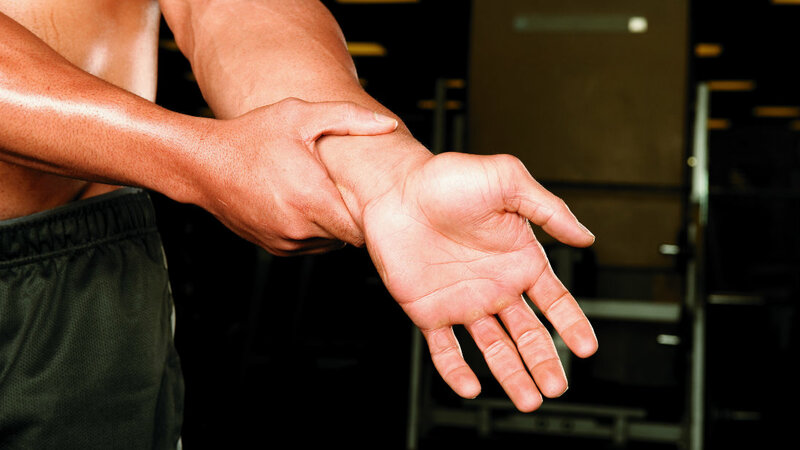 Wrist flexion when pulling heavy or pushing too much or too fast from the base of your palm can lead to carpal tunnel syndrome. Focus on holding the wrist in a more neutral manner and avoid cheating with heavy weight. Laying off the weights when you feel that zing or using a night splint can help limit symptoms. Most people sleep with their wrists flexed, which causes more nerve compression.